Some people are born to entertain. It’s a special kind of magic. Sally Pomme Clayton has that magic in plenty – she is a professional story-teller, a dream-weaver, a spell-binder. She works and lectures all over the UK and Europe and was a founder member of the Company of Storytellers. Londonist has been lucky enough to see her in action: the awestruck faces, delighted giggles, eyes wide in wonder…and that’s just the adults in the audience. Not content with regular reading and research, Sally spent months touring the steppes of Central Asia, learning to talk the talk, walk the walk, and tell the Tales. The result was Tales Told in Tents, a beautifully illustrated children’s book which came out a couple of years ago. 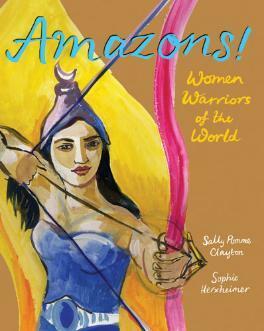 Her new book, Amazons! Women Warriors of the World is published this month by Francis Lincoln. I don’t think it ever went away! What makes a good storyteller? What are the qualities required? It’s like walking a tightrope. You need to be able to bring the story to life but not get in the way of it. And bring images to life inside the listener. Londonist can’t even remember where we hid the chocolate biscuits, let alone commit vast epics to memory – how do you remember all these tales? Hard work! Repetition. And my Mum did memory training games with me when I was little. It's about rhythm too. The new book is about what it means to be an Amazon - that’s more about inner strength than fighting. It’s really about being brave, whatever your gender. What’s the best London venue for story-telling? Is it about accoustics or is intimacy more important? Persepolis (the shop) has the atmosphere of a caravansary, the British museum has the objects which helps contextualize the stories and the Barbican has silence so the words can ring… I would ideally like all three. What effect has the internet had on story-telling? I used the have scour old libraries and second hand book shops for books like Siberian folktales from 1890 - now their available on line. Is it hard to keep it real when you live in fairyland? If you were a character from a story, who would you be? Sometimes the princess who gets lost in the forest and has to be very brave and undergo tasks and trails, and sometimes the witch Babayaga who terrifies her. There is one about a man who comes to old London bridge when it was made of wood to hear good news…and eventually finds gold…under his own tree at home. Yes! Well on the platform actually. 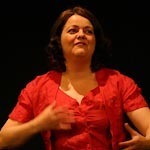 You can catch up with Sally at the Peckham Literary Festival where she will be performing on the 21st November 2008. Admission is free, which is always nice. But she would like you to bring your stories along to share….